The Maxilift ML 400 and 500 cranes are often embedded in complex machinery and used without a hook as hydraulic arms to meet construction needs in various sectors: mining, pipeline, forestry and marine applications. The marine version has a special anti-corrosion treatment which enables it to withstand the harsh effects of salt water. 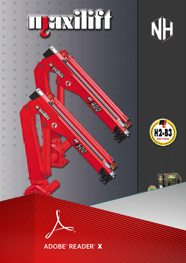 The range offers two models that differ in the lifting capacity: 4 TM for ML 400 and the ML 500 for 5 TM. In both models, you can choose between versions of a range of radii ranging from 3.65m to 5.75 m. These heavy duty cranes can also be equipped for winch (1,000 kg), remote control and manual extensions. Copyright © 2018 Cranetech Australia.